We believe when patients feel safe, they feel better. we strive to have a positive impact on the quality of life for people with reduced mobility and their caregivers. We aim to reduce the strain and complexity of lifting / transferring through education and the use of our professional, ergonomically designed lifting technology. As a caregiver you face numerous challenges throughout the day. Safely lifting and transferring patients shouldn't be a strain on your back. 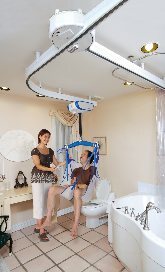 With help from BHM's V4 fixed ceiling lift, the most technologically advanced lift on the market, you will perform safely and effortlessly transfers of patients from a chair to the bed, the bed to a chair, into the bathtub or to the toilet.